LEE BROWN has lifted the lid on why Jamal Lowe is a nightmare for opposition full-backs. The former Bristol Rovers man believes the winger’s pace, power and ability to take defenders into uncomofrtable situations is why he’s such a threat for Pompey. Jamal Lowe, right, and Lee Brown. Picture: Daniel Chesterton. 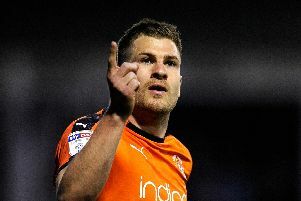 Lowe has been one of Kenny Jackett’s chief outlets during their League One title charge this season. The former Hampton & Richmond talent is the Blues’ joint-top scorer with seven goals, while he’s also recorded five assists. Lowe is blessed with rapid pace and left-back Brown revealed that’s an attribute a lot of defenders don’t like coming up against. ‘Jamal is a threat,’ he said. ‘He is quick, powerful and he is strong. ‘It’s brilliant for me to link up with Ronan Curtis and it’s the same with Nathan Thompson and Jamal on the right-hand side. ‘He’s skilful as well which people don’t really appreciate. ‘A lot of full-backs don’t really like playing at pace. Brown also believes Lowe’s latest attribute of cutting in from the flank also makes him difficult to nullify. He added: ‘Jamal has also added cutting inside into his game. Probably a couple of years ago he’d favour knocking it down the wing. ‘But he has added much more creativity to his game by coming inside. ‘When wingers come inside it’s such a hard one to defend as a full-back because you don’t really want to go in there.